The Cedar is a ranch-style home that has a total area of 3,589 square feet. Once finished, this charming home has a floor area of 2,078 feet. 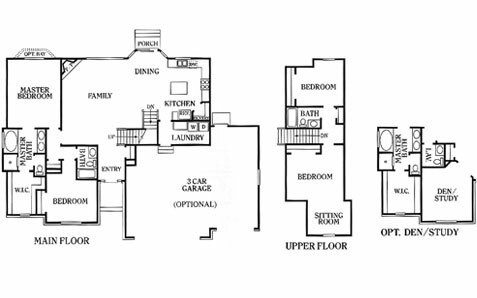 The first floor has the master bedroom with an incorporated bath and walk-in closet. This floor also has a smaller bedroom, a shared full bath, a laundry area, and the great room. The great room includes a spacious kitchen with a large island, a dining area, and a family room with a fireplace. The upper floor has 2 bedrooms with a shared bath in between, as well as a sitting room in one corner. The homeowners can opt for a three-car garage. The smaller bedroom near the master bedroom can be converted into a den or study, and the shared bath beside it can be turned into a lavatory. Perry Homes Utah makes choosing your next home a great experience. Our company is committed to making the process of building your dream home in a family-friendly community as easy and as seamless as possible. We’ve built heritage homes for 40 years, and we’ve done so at a reasonable price range, without compromising the design and craftsmanship of our projects. Ready to get started? Once you choose to work with our company, we’ll partner you with a design specialist who can walk you through all your options and direct you to construction experts who can answer all your practical concerns. We’ll keep you involved throughout the whole process to ensure that the home will match your vision and lifestyle. Receive or download the plans for the Cedar today and start building a home you and your family will love living in. You can count on our company to always be available for all your pre- and post-construction concerns. Get in touch with Perry Homes Utah today by calling 801-264-8800 or using our Contact Us page.